ArchiFab is an online platform that allows you to send your house plans to professional architects and designers to transform them into interactive and customizable 3D models. 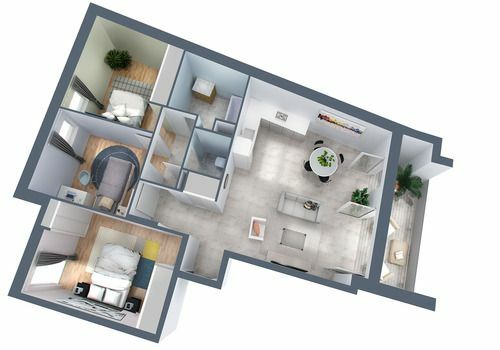 The 3D model of a plan allows you to better understand and present the available space in a house or apartment. The layout of the rooms is reflected and it is then possible to optimize the distribution of furniture in the interior space. The plan is then easier to read for individuals who are not used to reading a classic plan and its technical specifications. The plans proposed by ArchiFab are modular, in order to be more or less loaded with information. Thus, if you simply want to present a property through a window or on a website, a lightweight version of the plan simply showing the layout of the rooms can be obtained. If, on the other hand, you want a more detailed plan for a preliminary design study, the ArchiFab options are modular to display dimensions, available surfaces and annotations. The ArchiFab team is composed of architects, draftsmen, interior designers and 3D artists in order to guarantee you the best possible quality for your 3D home.